This tutorial describes the process of sending an email with a link to an article on you Joomla website. If you find an article that you believe will be interesting to a friend or a colleague, you can always send an email with the link of that article directly via the Joomla website. 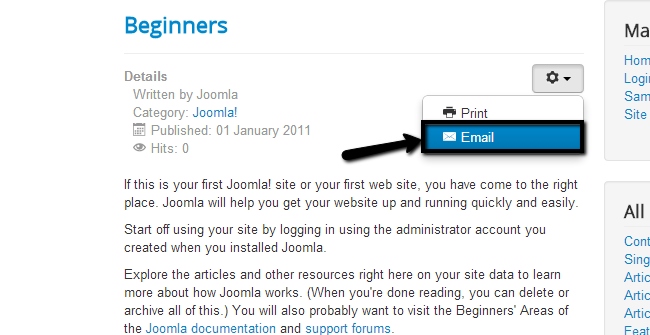 To do that, access your Joomla website. Navigate to any article that you wish to email, click on the Option button next to its title and select Email. Email to: Enter the email address of the person that you would like to send the article to. 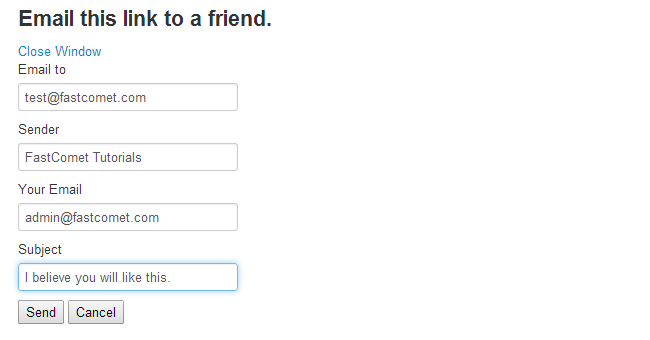 Your Email: Enter your email address. Subject: Enter a short subject for the email message. Click the Send button. After the email is send successfully you will receive a confirmation message.